Marketing campaign optimization is key for turning your strategy into a powerful marketing machine. But many marketers struggle to stay on top of optimization best practices. Have you ever felt that, despite the best of intentions, your marketing strategy is like a paper tiger? It has the shape and form of something grand, but is in reality it’s flimsy and ephemeral? We’ve seen that happen time and again; CMOs who create strategies based on pure speculation, assumptions, and hearsay. Nothing is grounded in reality. When the time comes to actually execute, the marketing campaign results are invariably poor and disappointing, leaving the CMO (and the business) at a loss as to what to do next. Even good CMOs can find themselves in this situation. But the best executives don’t rely on a “set-and-forget” strategy. They continually evaluate and optimize marketing campaigns to ensure that every dollar of their hard-earned budget is being spent wisely. You can do this, too. However, the first step isn’t analyzing the metrics; it’s setting up your campaign to collect the metrics. What’s the best way to track marketing campaigns? In today’s connected, digital world, there is absolutely no excuse for not tracking your campaigns. Even the most basic marketing campaign measurement metric, website traffic, can provide valuable marketing insights. We are, of course, going to go much deeper than that. UTM parameters are tags that you add to a URL, which are tracked by Google Analytics when the link is clicked. They’re used to measure the effectiveness of your campaigns and discover which channels drive the most traffic. The above example doesn’t just tell you that you’re getting traffic from LinkedIn; it also tells you which type of content is responsible for that traffic, and what campaigns work best. Due to their ease of use and integration with multiple analytics tools, UTM parameters are an essential component of any social media marketing campaign. You can use our handy URL builder to create some of your own. There are dozens of marketing analytics tools on the market, and it’s very difficult to choose between them. The difficulty isn’t in finding the good ones (most tools are); it’s in finding the ones that are good for you. What channels do your marketing campaigns employ? How quickly do leads convert and when? What is your team’s technical skill level? What level of management will be using the analytics tool? What information do you need the tool to provide? Do you need CRM integration? The answers to these questions (and more) will help you identify which tools are right for your organization and can help your marketing campaign optimization. Omni-channel marketing campaigns focus on delivering a seamless customer experience across multiple channels. Due to the nature of these integrated campaigns, in which a prospect can bounce between multiple channels before finally making a sale, it’s necessary to manage your data very closely. The biggest key to tracking your omni-channel campaigns successfully is by implementing a multi-touch attribution model, which shares credit for the sale among all the different touchpoints of the customer journey. It allows you to determine which elements of your marketing mix are consistently contributing to sales and quantifies their value to your overall strategy. More CMOs are being placed in a position of having to justify their marketing budgets, so it’s important for each marketing campaign plan to also deliver a decent ROI. But how do you determine that in the first place? Decent ROI simply means that for every dollar you invest, you receive more than one dollar back. If your primary metric is revenue or sales, then ROI is easy to determine. However, longer-term marketing campaigns or buying cycles require a different approach. You need to use leading metrics that serve as proxies for revenue to be able to conduct campaign performance analysis in real time and thus optimize on the fly. Now that you know the importance of optimizing your marketing campaigns, let’s talk about the best practices that can deliver said results. Many marketers think in terms of channel first, as in “email marketing campaign” or “social media campaign” in isolation. However, all of these channels support the same strategy and should be handled as such. Determine your marketing strategy first and then establish the ideal marketing mix that will get you there. If it requires more use of a specific channel and less of another, then that’s already your first big step towards marketing campaign optimization. 2. Incorporate metrics from the start. Before the campaign even launches, you should already know which of the above metrics you’re going to measure and establish the means to do so. Set up your UTM parameters, keywords and KPIs, and warm up the tools you’ll be using to analyze them. PPC advertising doesn’t require this much effort, because the relevant metrics are already built into the PPC process. 3. Use the strengths of different platforms. A successful omni-channel strategy doesn’t just say the same thing across multiple media channels; it uses each channel’s best strengths to fulfill the marketing strategy. Social media, for instance, works best when building customer relationships, while content marketing serves to educate and engage customers from a learning standpoint. Attempting to shoehorn channels into purposes that they weren’t built for (like using a blog as a sales platform) simply won’t work. Marketers should absolutely leverage customer behavioral and demographic data that they collect from previous campaigns. Not only does this make for deeper and more insightful analysis, but customers also appreciate that you’re customizing the message just for them. Personalization takes many forms: from retargeting ads based on previous site visits to inserting a person’s name in a promotional email. It can go very deep as well, like how retail brands send a curated list of products based on a customer’s previous purchases (or even page visits). Don’t just stick to one design over the course of multiple campaigns. A/B testing is a key component of website and email marketing campaign optimization, and involves constantly testing different variations of layout and copy for conversion rates. A/B testing usually only nets you a boost of a few percentage points with every successful change. But those small jumps in traffic and conversions eventually add up to big numbers. Once you’ve got your campaigns optimized, it’s time to sit back and reap the rewards. Right? Not quite. You still have to be accountable for the time and resources invested in these campaigns. Are they bringing value to the organization? What’s the ROI? Does the optimization help significantly? Your C-suite is asking for answers. Fortunately, you have them. Reporting on campaign performance comes with the territory, whether you’re a marketing manager or a CMO. If you want to properly communicate how effective your marketing campaign optimization efforts have been, you need to speak to the C-suite in their language: hard numbers. TrackMaven’s funnel attribution tool actually gives marketers the ability to prove how their content and campaigns generate pipeline, revenue, and deals. Based on integrations with Salesforce, Marketo, Hubspot, Google Analytics, and more, TrackMaven Funnel Attribution simplifies reporting so you can double-down on profitable campaigns and stop wasting money on campaigns that don’t work. Full-funnel campaign attribution. Understand which campaigns are driving results at each stage of your marketing pipeline. Directly compare campaigns across channels, and see the conversion rate and velocity between each stage. Campaign content-attribution down to the post-level. Gain a deep understanding of which web pages and social media posts are key to converting customers instead of driving uninterested eyeballs. TrackMaven’s platform lets you do all of these and a lot more. 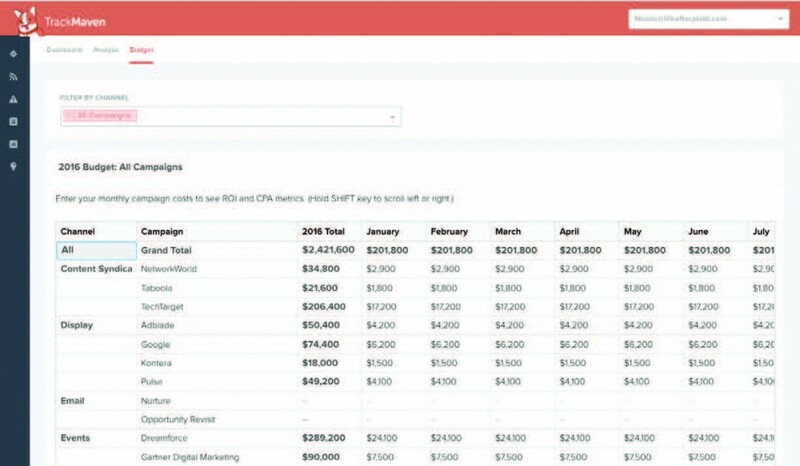 Get a free, custom demo to see how TrackMaven can help you prove campaign ROI. While it’s tempting to report campaign performance on a daily basis (especially for high-profile campaigns), it’s better to space out the reports weekly or even monthly, depending on how often the C-suite meets. This will make trends more obvious and give any marketing campaign optimization measures (like switching keywords or A/B Testing designs) more opportunity to have an impact. If you don’t, you may end up making a rash decision if the numbers dip temporarily. The more you base your campaign on real-time data, the more informed you’ll be. You will make wiser decisions based on these campaign numbers, and you’ll be able to optimize your marketing campaigns much more effectively. Don’t run away from the numbers. Collect and analyze the right metrics so that you can steer your marketing strategy in the best direction. Eventually, you’ll have hard evidence to prove that marketing is significantly contributing to your organization’s bottom line. Want to uncover digital marketing benchmarks for your industry? Download your free copy of the 2017 Digital Marketing Analytics Performance Report today!